3.2 How do I request a territory? 6.3 What's happening in this world right now? For your first 7 days you may edit only in territories which are colored blue on our overview map. After that you may claim a territory of your own. You are encouraged to read OGF:Blue country etiquette during and before editing these territories. How do I request a territory? After you have spent 7 days mapping in one of the blue countries on the overview map, you may choose one of the available territories, which are displayed in light green. Once you've made your choice, send a message to admin to request the territory. Make sure to include the territory number from the overview map in your message. Remember that requests for territories are always subject to admin approval, so please wait for confirmation that the territory has actually been released to you. What size project do you want? Large territories can be rewarding, but may also require a great deal of effort. Many users find smaller territories to be more manageable. What climate do you want? Different parts of the world have different climates, some of which are indicated in the territory description on the overview map. If you want palm trees and coral reefs, choose a country in a tropical zone. If you want snowmen and glaciers, choose a country in a colder area. What kind of neighbors do you want? Before choosing a territory, look to see who the neighbors are, and what they've built in their countries. Sometimes within a few hours, sometimes a few days. It depends on how busy things are, and whether there's any difficulty granting the request. For example, if someone has rule violations that need to be addressed, or if there are serious issues with their mapping quality, or if they request a territory that's too large, or if the admin team wants to suggest an alternate location that seems more suitable for their vision, then it takes extra time to sort out. Please be patient. In the meantime, you can obviously continue mapping in the blue territories, and then move whatever you build there into your new country, when it becomes yours. Currently, and for reasons beyond our control, territory requests are not being fulfilled. There is no timeline for resolving this issue, but please understand that we are working on it in good faith. 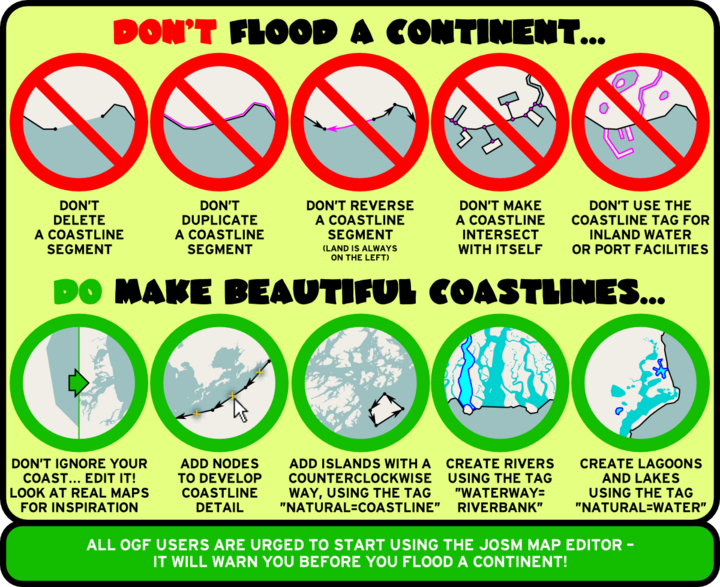 Meanwhile, you are not exempt from the rules - please limit your mapping to blue "free to edit" territories or participate in purple collaborative territories. Impatience for your own territory is not a reasonable excuse for breaking rules, and will see your request moved to the bottom of the territory-granting queue when the time comes to resume granting territories. To display your the country name on the map, see OGF: Adding your country name to the map, which shows how to change the name tag of your country's boundary relation. What's happening in this world right now? You can browse our world's latest news stories at the OGN World News Center.